and see if that solves the problem. This is the default folder that HorizonsAutomator3 tries to save the .gsim files it creates to. It always gives you the option to select a different folder, so if adding this folder takes away the error, you can delte the new folder if you like and simply ignore the error. Thanks for pointing this out. I get the same problems you do if I run the version straight off the web. Let me look into this. I know you've confirmed that this file exists. I'm not sure if there's anything that European Windows does differently with filenames, preventing it from finding a file that exists. Frank, do you have insight? Does this program work for you, or do you get the same errors? Don't give up yet, maud!! We'll figure it out. This is the toughest part about sharing software: assuming it will work fine on other computers. The program does not perform smoothly on my PC either . I got to the link you gave , downloaded all again and ran the "zero" version , not the "3" . The "3" does not perform any button action . At what point do you get that error? 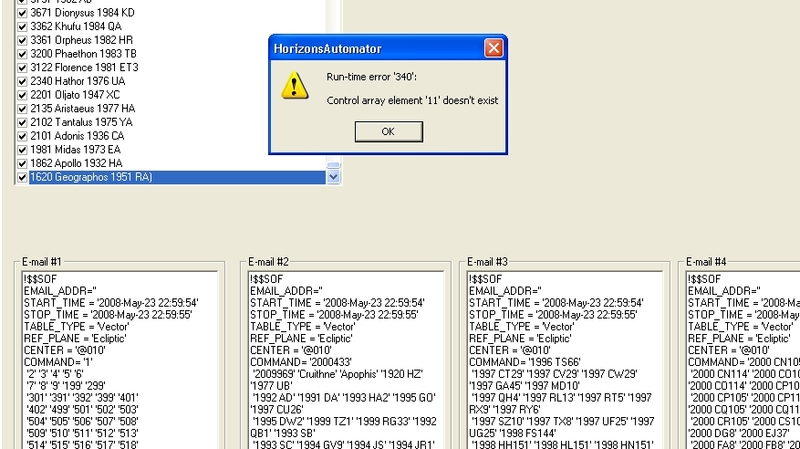 It looks like you pressed "select all"
Do you get that error if you try to make simulations that are under 200 objects? The program ; without index "3" works ! . I selected all the planets and some asteroids ... and created an e-mail . Maybe the program "3" has some difficulty with the / in the filename , as the typeboard in Europe has other characters ? Do you need the full drive name in Vbasic ? In Powerbasic I only use the filename to import files in a program . I came to this particular asteroid through another post . In the animation herunder one can see the asteroid as seen from the sun , viewing to Jupiter . Simulation was run for ca. 45 years . 2008KO, 2008KT, 2008LD and 2008LB, ranging from 3.4 to 1.1 Lunar Distances . 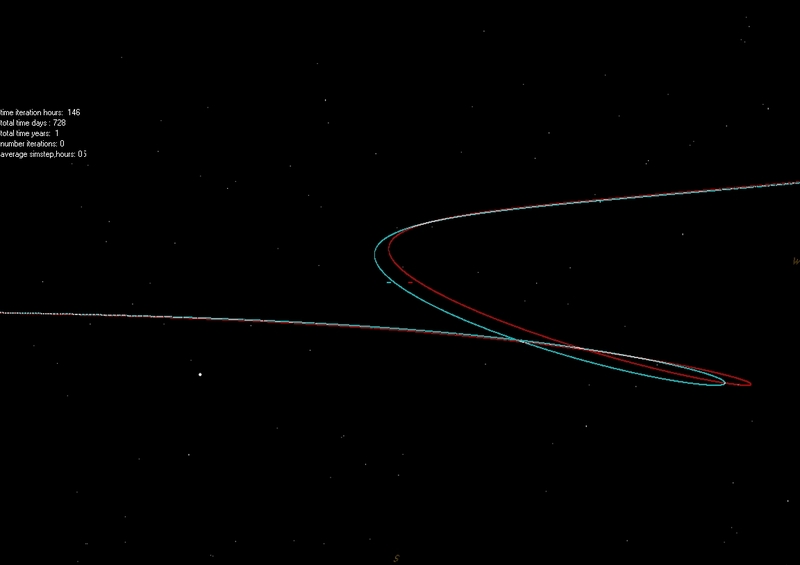 Heres a animation of this flybys . First part shows the view from Sol . Second part shows the same viewpoint but in 3D anaglyph . 1 Frame corresponds with 36 days . There seems not to be an orbital connection between the four asteroids . It is quite unusual to have 4 close flybys in such a short time . Clicking on the icon above opens a new window wich in my opnion gets the best view. Asteroids : 1999TZ1's heartbeat ..
What's causing asteroids 1999TZ1 heartbeat as shown in the simulation herunder ? 1999TZ1 is a Jovian Trojan orbiting in a high inclinated orbit . The SMA seems to pulsate in a rather regular way . Animation spans for 400 years . every frame covers 11.86 years . Jupiter and the ast are viewed from above . Running the simulation for a much longer time gives a precession of perihelion , but also a pulsating change of the perihelion . 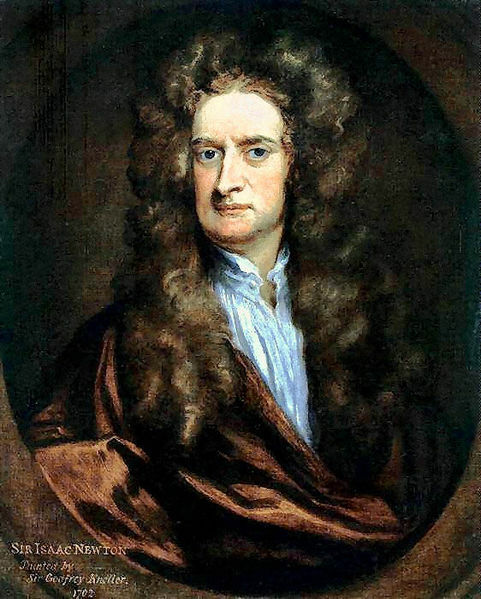 Where the perihelion is at 2 'o clock the perihelion shifts to 8 'o clock periodically . It's probably just an artifact of the viewing angle. For example, the following image can be perceived as the planets having 2 perihelions each: one at 12 o'clock and 1 at 6 o'clock. If its a trojan, the semi-major axis should pulsate, causing a periodic change in its orbital period making it drift ahead of and behind the Lagrange point. Yes its a Trojan of Jupiter, and you're right :it should pulsate , but it"s the first time I observe this this clear. I made a picture of the evolution of SMA and inclination . Eccentricity however is stable. Both pulsate and are dephased over 180° . I wonder what gives this long period , seeming to be about 175 years . Any idea how the pulsation frequency is related to the major body's orbital period ? 2008BT15 must have been discovered long time ago , but for some reason it has a 2008 designation . It has a diameter of about 1 km and will come as close as 5.9LD on july 14th . Herunder is a frozen picture of its path in anaglyph showing the orbit seen from the sun centered on earth . The line in the middle represents moons orbit. The asteroid comes from the left , seems to make a loop and approaches Earth going to the left again . If the 3D glasses work fine the asteroid should come out of the screen at the right . Is it ? I've made a selection of two asteroids with very high eccentricity . Here they are 2006HY51 and 2008HW1. Both have eccentricities above 0.95. They might have been twins , although they're separated in inclination by about 20°. Moreover :the orbits of the minor plantes Ceres , Pallas , Juno , Vesta and Hygiea are the greyscaled orbits . It's funny : 3 of them seem to go through one point . On 02/01/2009 this really big asteroid was discovered . It ranks highest in Palermo scale among the newly discovered ones with an estimated diameter of about 900 meters . The orbital parameters still show a lot of sigma ( sma = 0.88 +/- 0.14sigma) after only 10 observations . The animation herunder shows the most likely orbit in rotating frame to Earth . Animation starts at 01/02/2007. The green dot in the last picture shows the approximate location of 2009AV at the time of discovery . As more observations will become available I'll try to update if necessary .